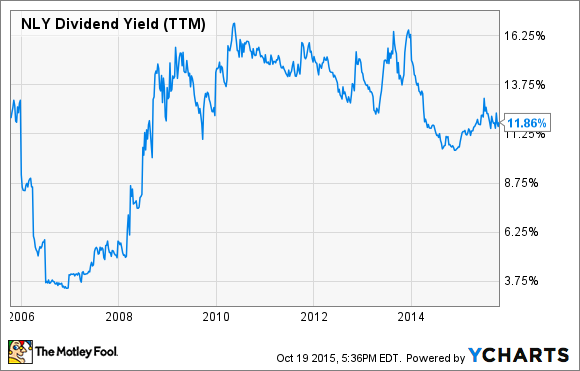 On the hunt for dividend paying stocks with high yields? Our contributors think you should look at these stocks. It hasn't been a great year to have money in the stock market, with the S&P 500 in negative territory since the beginning of the year. In times like these, stocks with high dividend yields become more attractive, as dividends flow back to their investors' pockets regardless of the performance of the stocks themselves. One great ETF that fits the bill is the Vanguard Dividend Appreciation ETF (NYSEMKT:VIG). This ETF doesn't focus on the absolute highest-yield stocks in the market. It puts a premium instead on stocks that not only offer healthy dividend income right now, but also have a history of consistently raising their dividends over time. By emphasizing dividend growth at least as much as current yield, this Vanguard ETF is a good choice for long-term investors who want their quarterly investment income to get larger over time. Moreover, by having a diversified set of dividend stocks in the portfolio, investors are protected even if one of those stocks cuts its dividend and experiences a big share-price decline. Vanguard Dividend Appreciation won't skyrocket quickly, but it seems to offer solid long-term returns at an attractive risk level. Brian Feroldi: It's no secret that the last year has been brutal to stocks in the energy sector, as the free-fall in oil prices has caused investors in the space to sell nearly every stock in the sector, regardless of its actual dependence on the price of oil to generate revenue. While it's impossible to know where the price of oil will go from here, with so many stocks in the space now selling at a discount, investors who are after high yields and willing to take on some risk might want to consider master limited partnerships, or MLPs. One name I like a lot in the space is ONEOK (NYSE:OKE), which, while not a MLP itself, offers direct exposure to one through its 41% ownership stake in ONEOK Partners, a MLP focused on natural gas. Oneok Partners generates its revenue primarily through fee-based activities like moving gas through its huge pipeline network, which helps to keep revenue flowing even when commodity prices collapse. One reason I like Oneok over the MLP itself is that, as the general partner, it holds incentive distribution rights that allow it to keep an increasing share of Oneok Partners growing profits for itself after certain distribution target levels are reached. Through this arrangement nearly 70% of the additional profits generated at Oneok Partners gets kicked back up to Oneok, which should allow Oneok to grow its profits, and hence its dividend, faster than Oneok Partners itself can. It's not a risk-free investment, but if you want a high dividend yield and the potential for capital gains, Oneok may be a solid choice. Matt Frankel: One great way to get high dividends is with real estate investment trusts (REITs), as these companies must pay out at least 90% of their taxable income in order to avoid corporate income taxes. One specific REIT I have my eye on is Iron Mountain (NYSE:IRM), a specialized company providing secure storage for information, records management, and data protection services. Iron Mountain plans to deploy capital in strategic acquisitions, especially in emerging markets. The company feels that increasing its presence in attractive but underserved markets around the globe presents the best opportunity to generate the widest profit margins going forward. In fact, Iron Mountain anticipates that 20% of the company's revenue will come from emerging markets by 2020, up from 14% today. Currently, Iron Mountain pays a 6% dividend yield, which should satisfy most income-seeking investors. After all, a high yield coupled with legitimate growth potential can produce serious wealth over the long run. The company also projects that its dividend will grow at a minimum 4% annual rate, which should help income investors keep up with inflation as well. Selena Maranjian: One way to enjoy fat dividends in your portfolio is to buy stock in companies that don't necessarily offer sizable yields right now, but are increasing their payouts at a brisk rate. Imagine, for example, Fred Co. (ticker: TAPTAP) and Ginger (ticker: TWIRL), both trading at $100 per share right now. Let's say that Fred's $5 annual dividend yields 5% right now, while Ginger's $2 dividend yields 2%. If Fred's grows at just 3% annually over the next 20 years, it will give today's investors an effective yield of 9%. That's what they'd be collecting in 20 years, based on their purchase price today. If Ginger increases her much smaller dividend by an annual average of 10% over the next 20 years, her payout will eclipse Fred's, yielding 13.5%. In short, it's fine to seek out substantial dividend yields when you're looking for great income-generating investments, but be sure you check out their dividend growth rates, too, as they can be great growth catalysts. A company that seems to offer potential in this regard is W. W. Grainger (NYSE:GWW), which distributes industrial equipment -- everything from lubricants to hydraulic hoses to asbestos abatement equipment. You may not have heard of the company, but it sports a market value near $13 billion and has seen its stock grow by an annual average of 13% over the past 30 years. W. W. Grainger's dividend recently yielded just 2.1%, but it has been increased by an annual average of 17% over the past five years. The company's revenue growth has stalled because of industrial headwinds, but management aims to keep growing market share regardless while it invests in further growth. Sean Williams: If you want dividends that consistently outpace the average yield of the S&P 500 (which is around 2%), and you have a moderate to slightly higher level of risk tolerance, then I'd encourage you to explore the mortgage real estate investment trust (mREIT) industry. On the surface, that might not seem like a great combination worth investing in, but an mREIT like Annaly Capital Management (NYSE:NLY) has a long history of success on its side that investors can believe in. During its Q2 earnings release, Annaly announced a $1 billion share repurchase program and has focused on shorter maturity dates in recent years, which should allow it to be more nimble as rates rise. Also, with the Federal Reserve walking on eggshells in its approach to rate hikes, the negatives associated with an eventual rise to 2% may already be baked into Annaly's valuation. Furthermore, even with lending rates above 6%, Annaly has demonstrated a history of maintaining a superior dividend. Over the past decade, Annaly's yield has averaged around 10% annually, which would allow you to net back all of your initial investment over a period of just seven years exclusive of share price movements. Currently priced modestly below its book value, and boasting a tenured and focused management team, I see no reason why high-dividend-seeking investors shouldn't consider an mREIT like Annaly Capital Management for their income portfolios.